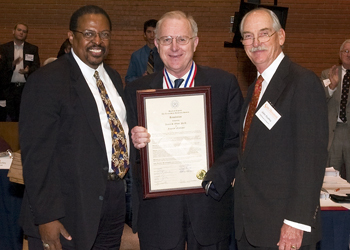 James S. Olson, center, distinguished professor of history, was presented a resolution listing his many accomplishments by members of the Sam Houston State University board of regents Bernie Francis, left, and John Dudley, right. James S. Olson, distinguished professor of history at Sam Houston State University, has added the title of "regents' professor to his many other honors. The university's board of regents announced the honor during their recent meeting on campus. Now, Therefore, Be It Resolved on this 16th day of August 2007 that James S. Olson, Ph.D. be designated a Regents' Professor and forever hold said title, including all honors, rights and privileges appurtenant thereto.